Hanging in Kim Crompton’s office is an old black-and-white photo of a boy reaching for his dream. Standing on tiptoe, the toddler stretches his hands to the keyboard of a manual typewriter. Behind him stands the desk of a country newspaper editor. Crompton’s been reaching for that dream ever since. Reaching for a good story. Reaching for readers. And finding them. His dad, who took that picture, owned a series of weekly newspapers. Starting in Utah, the family soon settled in the high-altitude potato growing country of southern Idaho. There, along the Snake River, Crompton learned by age 8 to set headlines, arranging blocks of type on a metal tray. He learned to run a flatbed press. By age 12, he was pouring molten lead to make the ingots that fed the ancient, clattering Linotype machines. There was never any question what Crompton would do with his life: “I wanted to be in newspapering. On weekends, I had a choice – to go to church or work with my dad at the weekly newspaper.” The printer’s ink won, and stuck. This week, Crompton’s career comes to an end. He’s retiring as editor of the Journal of Business. Published every two weeks, the 14,000-circulation newspaper focuses on business news in Spokane and Kootenai counties. Crompton has worked there since 1989 – first as a reporter, then news editor, and becoming the editor in 2011. Earlier steps in his career laid the foundation for his rise at the Journal: a bachelor’s in journalism from University of Idaho, a year at the Post Register in Idaho Falls, five years as managing editor for his family’s newspaper in Gooding, Idaho, and 10 years as a reporter for The Spokane Daily Chronicle and The Spokesman-Review. In the 1980s an enterprising writer from The Spokesman-Review quit his job and joined some others to launch the Journal of Business; they soon recruited Crompton. 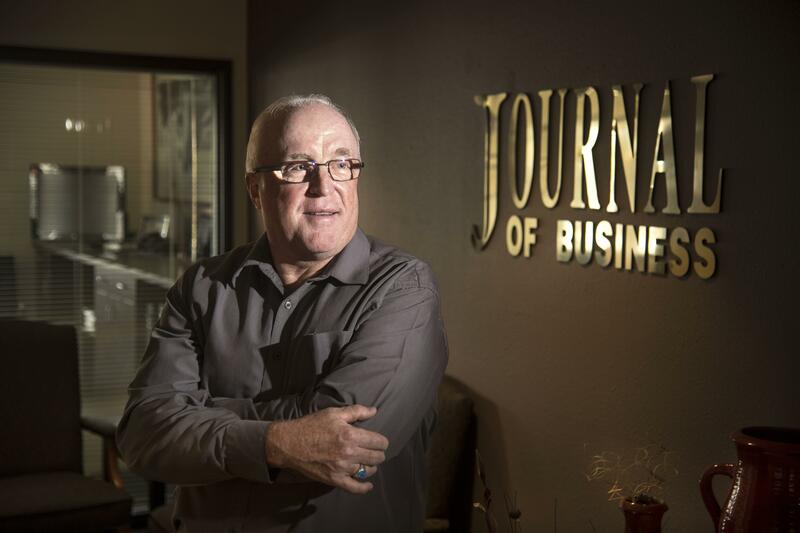 In 1995 the Journal’s founders, Norman Thorpe and Scott Crytser, sold the newspaper to a subsidiary of the Cowles Co., the family-owned Spokane firm that also owns The Spokesman-Review. But the Journal remained an independent publication, and today is read by an estimated 40,000 people, according to its web site. With the nation’s other newspapers experiencing sharp declines in circulation, revenue and staff, how did the Journal of Business protect the size of its 19-member staff, including six journalists – as well as its subscriber base, which experienced, Crompton said, only a “slight” decline? It did so by specializing in a niche no one else filled: the stories of the area’s small businesses. Not just the large and well-known corporations, but also the firms of 20 and fewer employees that manufacture, invent, sell, build, transport, invest, serve and, together, comprise the lion’s share of the Spokane area’s economy. Looking back, Crompton noted some of the long-term trends that strengthened Spokane over his career: for example, the rejuvenation of downtown’s retail and convention trade, the development of the University District and Kendall Yards, the improvements to Riverfront Park. Then there are the trends he finds troubling: “We used to have a fairly large number of publicly traded companies here. We’ve lost a number of them. They’re down to six or seven. But still, it’s the small companies that make up the vast majority of businesses here. As for Crompton, he’ll be reading someone else’s account of the story. In retirement, he said, he plans some wine tasting, travel, golf, cooking and possibly to write a novel or two. Printer’s ink, whose allure pulled a toddler into journalism and helped build a base of loyal business readers, is going to endure, Crompton said. Published: Sept. 1, 2017, 6 a.m.